Basaltic meteorites are common in the Solar System. This example from Mars — called North-West Africa (NWA) 7034, nicknamed "Black Beauty" — has a relatively large amount of water in it. 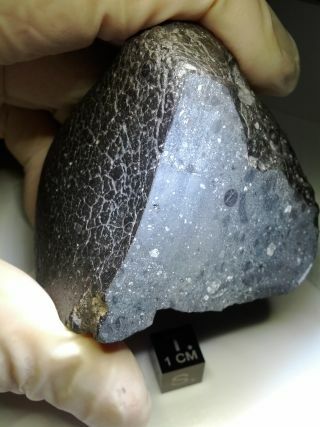 A new study of a rare basaltic meteorites called angrites suggests that volatiles, which are elements and molecules with relatively low boiling points such as water, could have been brought to our planet by meteorites during the first two million years of the Solar System. Since elements and molecules such as water and carbon are essential ingredients to life on Earth, researchers are keen to know when they arrived on our planet. During this time, the inner Solar System was a hot and dry place. Protoplanets and asteroids had molten surfaces and, when in magma, even an element such as carbon, which has a boiling point of 4,800 degrees Celsius (8672 degrees Fahrenheit), is considered to be a volatile. It has therefore been unclear when delicate, low-boiling-point substances such as water came aboard, particularly as the hydrogen required to make water molecules would have been boiled away by the high temperatures. The angrite parent body was likely similar in size to the asteroid Vesta, which has been studied up close by NASA's Dawn mission. Vesta is roughly 525 kilometers (326 miles) in diameter. By the time Earth was fully-formed 4.54 billion years ago, Mars already had a 20-million-year head start as a stable mass with water and other volatiles on its surface, such as carbon, fluorine, and chlorine, adds Sarafian. Other research has shown abundant evidence of water on Mars' surface in the ancient past, through features including ancient river beds and minerals formed in water, such as hematite. Sarafian's work was supported by the NASA Harriett G. Jenkins Graduate Fellowship Program, which included spending three months each year at the NASA Johnson Space Center working with Antarctic meteorite curator Dr. Kevin Righter (who also will analyze samples from asteroid Bennu collected by NASA's Origins, Spectral Interpretation, Resource Identification, Security-Regolith Explorer, or OSIRIS-REx).